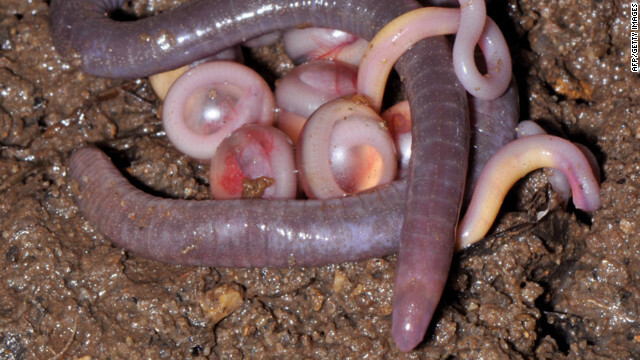 An adult Chikilidae, a new family of legless amphibian known as a caecilian, is shown with eggs and hatchlings in India. Scientists have found what they say is a new family of legless amphibians in Northeast India - animals they say may have diverged from similar vertebrates in Africa when the land masses separated tens of millions of years ago. The find, the scientists say, might foreshadow other discoveries in Northeast India and might help show the area played a more important evolutionary role than previously thought. The creatures are part of an order of limbless, soil-dwelling amphibians called caecilians - not to be confused with snakes, which are reptiles. Caecilians were previously known to consist of nine families in Asia, Africa and South America. But different bone structures in the head distinguish this apparent 10th family, and DNA testing links the creatures not to other caecilians in India, but to caecilians that are exclusively from Africa, the scientists report this week in the Proceedings of the Royal Society of London. Can we all agree that evolution is a fact? How much more evidence do we need?